The fieldstone Root Cellar (built in 1901) – one of the historic farm buildings in Burgoyne Bay Provincial Park on Salt Spring Island, British Columbia, Canada. Two weeks ago I arrived on British Columbia’s Salt Spring Island to visit friends and do a bit of photography. I had a few hours to spare before meeting anyone so I headed from Ganges towards Fulford Harbour with no specific destination in mind. I saw the sign for Burgoyne Bay Provincial Park and drove in to see what I would find. I had only done a small amount of research as to what I’d find on Salt Spring so this was really a random exploration kind of trip. Just as with Ruckle Provincial Park that I would explore the following day, much of Burgoyne Bay Provincial Park was used for farming before being turned into park land. 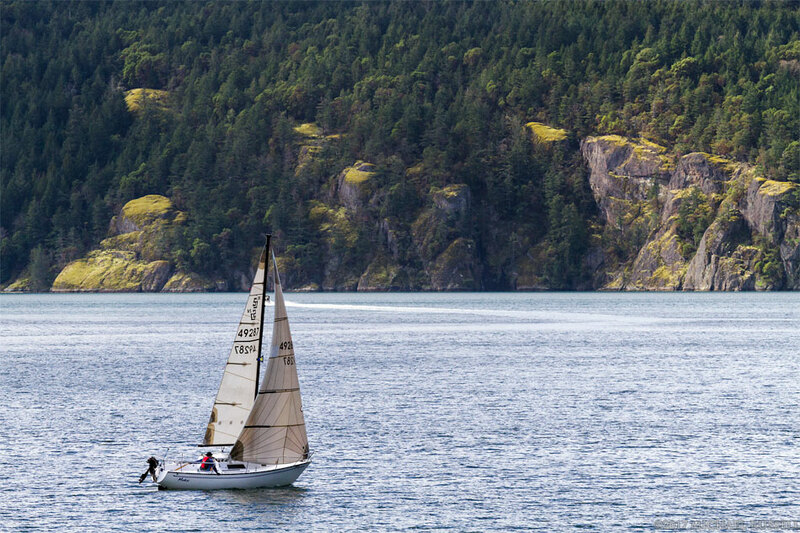 Burgoyne Bay was named by a British Royal Navy surveyor after Commander Hugh Talbot Burgoyne who was an officer on the HMS Ganges, another name familiar to those who know Salt Spring Island. Burgoyne Bay Provincial Park is adjacent to Mount Maxwell Provincial Park, which was named after John Maxwell. Maxwell registered a claim in 1861 to a parcel of land near Burgoyne Bay and together with partner James Lunney established a cattle ranch in the area. 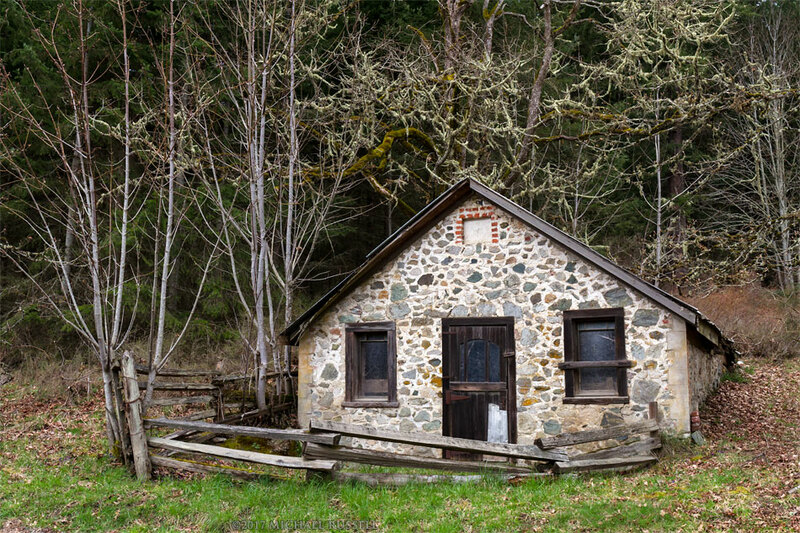 The first photograph here shows a root cellar build by John Maxwell’s son, Richard, in 1901. 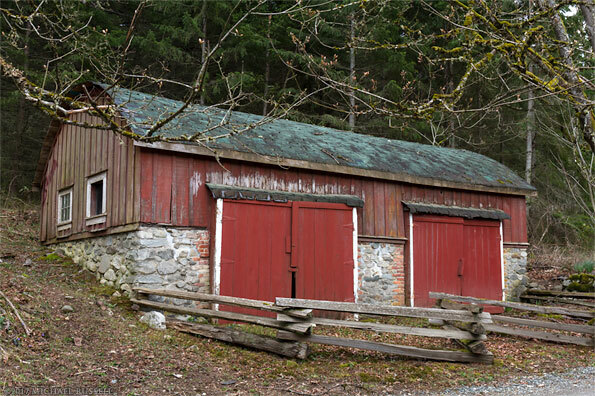 Just down Burgoyne Bay Road (photo of both buildings) from the “Richard Maxwell Root Cellar” is the Barrel-Roof Shed which was also built by Richard Maxwell (between 1900 and 1910). A fieldstone and wood structure, this shed was used for storing larger farm equipment which explain the two large access doors at the front. 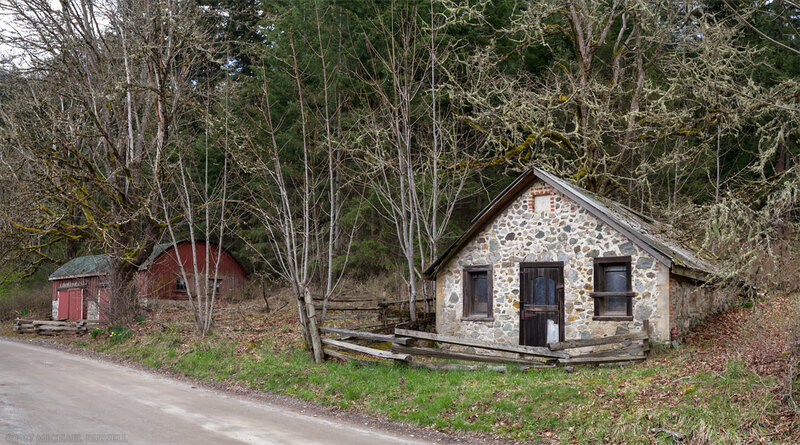 This building and the root cellar are two of the only remaining buildings from the Maxwell era, the other buildings were built by subsequent owners of the farm area, most notably the Larsons who purchased it in the 1940’s. Much of the history of the park and Burgoyne area are outlined on the park page on the BC Parks website – click on the Burgoyne Bay Park Management Plan pdf link for that information. With a name like Burgoyne Bay the photo above shows a bit more of what I was expecting when heading into the park. There were a number of boats moored at the dock at the end of the bay, with this sailboat being the only one in use at the time. The “Makai” sailed into the bay and I made this photograph as it left. The cliffs and forest you see in the background are on Vancouver Island near Duncan, BC. There are a number of trails that head through the farm fields and up Mount Maxwell that I plan to explore in the future. I am sure there are a number of features of the park that will be great photo subjects on a subsequent visit. 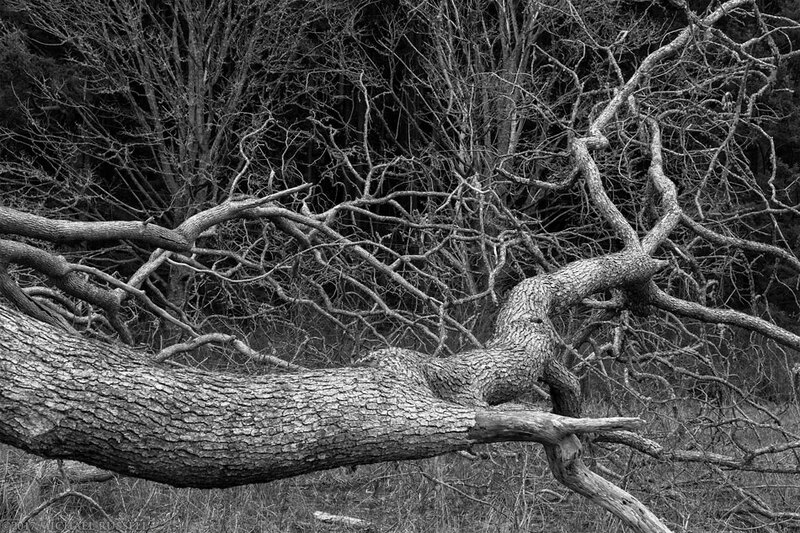 One landmark of note that I did visit was the spot where two Garry Oaks (Quercus garryana) had previously grown together in a field next to Burgoyne Bay Road. In early 2016 these two trees fell over in opposite directions – and the trunks and branches have been left. As Salt Spring is not a particularly large island I figured these trees falling might be noteworthy enough to have made the local paper. Sure enough there was a mention of the demise of these trees in the Gulf Islands Driftwood newspaper. For more photographs of the trees and farm buildings in the Burgoyne Valley visit my Burgoyne Bay Provincial Park Gallery.